Our Natural Skin Care is Designed with Pure Whole Plant Extracts. Sourced for Vitality and a Synergistic Assimilation. They are Organic, Nutrient Rich, Cold Pressed, and Steam Distilled. Whole Plants for Whole People, Skin Care Guardian Unlocks Nature's Affinity to Nurture, Restore, and Maintain Healthy Beauty. From the Karite Tree (which means ‘Tree of Life’ in Africa. 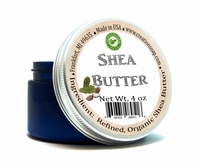 Deeply moisturizing, beneficial for many skin conditions, such as blemishes, frost bite, itching, etc. "The trademarks, logos, and service marks (collectively the "Trademarks") displayed herein are registered and unregistered trademarks of Creation Farm Inc, its affiliates and others. You can view trademarks owned by Creation Farm Inc on LegalForce Trademarkia at this link: http://www.trademarkia.com/company-creation-farm-inc-4673895-page-1-2. . Nothing contained herein should be construed as granting, by implication, estoppel, or otherwise, any license or right to use any trademark displayed herein without the written permission of Creation Farm Inc or such third party that may own the trademark displayed herein. Your misuse of the trademarks displayed herein, or any other content on this web site, except as provided herein, is strictly prohibited."